Fans of Mr. Percival will finally get to see his journey on the big screen for their kids as director Shawn Seet helms the adaptation of Colin Thiele’s classic Storm Boy. 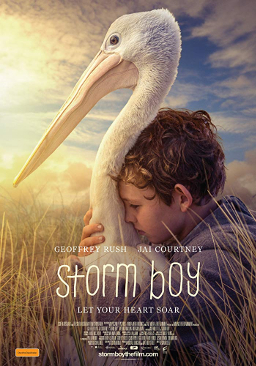 A lovely film, with a modern tone, Storm Boy follows the memories of Michael Kingley (Geoffrey Rush), now a retired businessman, sharing incredible childhood memories with his granddaughter, which he hadn’t thought about it awhile. 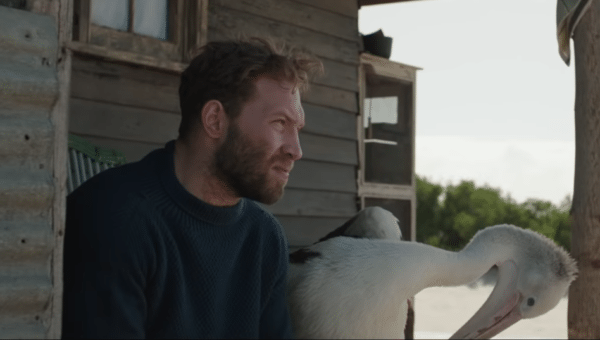 The time with his father (Jai Courtney) plays out as the young Michael (Finn Little) rehabs some orphaned pelicans, enjoying a remarkable adventure with Mr. Percival – one pelican who doesn’t leave the boy and his father. The boy truly bonds with his father, Hideaway Tom, but a tragedy leads to anger which leads to separation, leaving deep feelings of regret for the adult Michael. This is Michael’s message to his granddaughter: don’t make the same mistake with her dad. Storm Boy is a timeless story of an unusual friendship, a strong bond which we all marvel at when we see it. The story works on a several different levels: an appreciation of nature, cherish our time/our relationships and a personal journey of independence. Seet’s cast do a great job with the material at end, but there film does drag on a bit, especially for audiences addicted to the eye-candy of action films arriving this time of year. A message of the harsh reality should resonate in a time of ungratefulness and selfishness as Thiele’s story of lifting oneself out of grief and sadness is very powerful. I’ve never viewed the original 1976 film, so I have no frame of reference to compare it to this 2019 remake. Storm Boy is very enjoyable and sweet, completely family friendly, with some great life lessons for parents and their children. Let me just add that Trevor Jamieson is amazing as Fingerbone Bill, the wise mentor to the young Michael. Storm Boy also stars Morgana Davies and Erik Thompson.